Some tote bags and shoulder bags that I've made in the past few days. The red and blue ones have been sitting in my works in progress (WIP) pile for months now and I felt the need to clean. 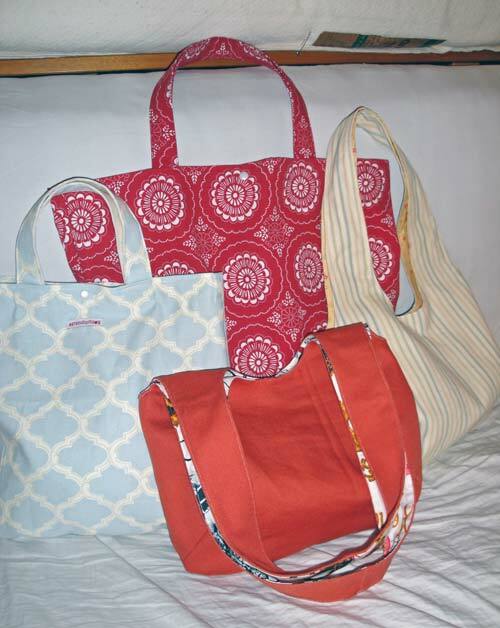 The pattern is a free classic tote tutorial from the Sew Mama Sew blog. I've sewn the bag so many times now because it's such a great pattern. On a lark, I added the snaps. 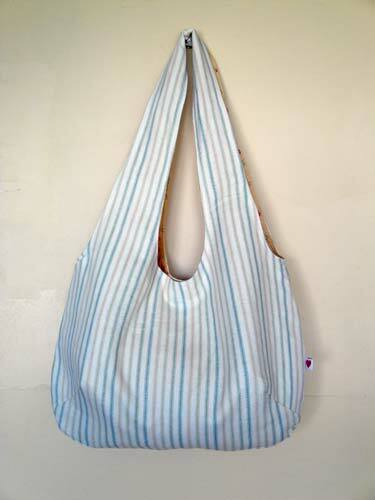 The orange and striped bag are made from another free tutorial online. This time from a very purple person. I ended up making the straps four times (!) on the striped one because I couldn't make up my mind about the length. The first time because I wanted to be able to wear it as a cross-body, but the straps were too short. So then I added length, but it looked awkward. Then I cut the straps to a shorter length only to mess up and make one of the straps a mobius strip. The fourth time was the charm. Thankfully I only had to sew the orange one just once. Lesson learned for now. I added a small inner pocket in the bag lining and also a metallic snap so that the bag won't gape open.